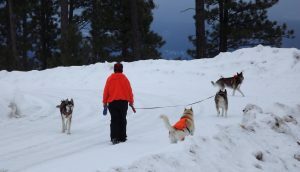 Beginning mushers – come and learn with caution, as hard to stop the dogs. 2019 Canine Fun Days – Snow Dogs You = FUN!!! Montana Mountain Mushers is a non-profit Montana organization which supports and promotes the informed and humane use of sled dog teams for work, transportation, pleasure, and sport. The organization provides information about running dogs and aspects associated with dog mushing and skijoring to mushers and the general public. 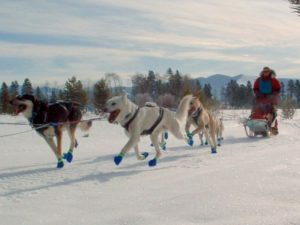 There are several Montana sled dog races that many of the members participate in, including Race to the Sky which is a qualifying race for the annual Alaskan Iditarod dog sled race. Please visit our Races link for more information. Come attend the start of one of these races for an experience you’ll never forget. Competitive sled dogs are amongst the best housed, trained, fed, and conditioned canine athletes in the world. They receive veterinary care that compares with the medical care that Olympic athletes receive. Each dog on the team plays an important, individual role, so every effort is made to keep each one in top physical and mental condition. To accomplish this, hours and hours are spent with the dogs, caring for them and keeping them in good spirits. Sled dogs quite literally love to run. Membership in the Montana Mountain Mushers is open to all and the information exchanged between members would assist anyone interested in sled dog care, skijoring, or mushing. Come join us! The trails in Montana are maintained by several different snowmobile clubs in the winter and are some of the best in the country. It is a privilege to run these trails. Anyone wishing to use Montana’s trails may, provided they follow a few simple rules, which will help to ensure everyone’s safety and enjoyment. When meeting a snowmobiler head-on, try to be as visible as possible so that the driver can see you. If you are approaching a corner, stop before the corner and wait for the snowmobiler to pass. Mushers can hear the snowmobile before they can see you and, of course, they are going faster. The snowmobiler needs to be able to get around your team. Allow plenty of time to react and space to maneuver. Work at keeping your team on the right side of the trail because this is what the snowmobilers are used to. When running the trails at night, use strobe lights on your lead dogs, reflective rope on your towlines, keep your headlamp on, consider a strobe light on the back of your hood, or reflective tape on the back and front of your parka. When being passed by a snowmobile from behind pull to the side and stop or slow your team until the snowmobiler(s) are safely around your team. When meeting another dog team, common courtesy is expected. Don’t follow too closely and if passing another team, make your intentions known. Common sense dictates that you pick a spot that is safe to pas or wait. If you are stopped on the trail, you must pull over enough so that snowmobilers, skiers, and other dog teams can go around you safely. Choose a spot to stop that is safely visible. Using Montana’s trails are a privilege. Please leave the trail in better shape than you found it. Forest service maps and snowmobile maps provide a great reference for finding the trails in Montana. They are available locally at snowmobile shops and the Forest Service offices. Be prepared before you leave the trailhead for winter camping and taking care of yourself and your team in an emergency. If we all work together, Montana’s multi-use trails can be enjoyed by all. After all, they are some of Montana’s greatest assets and we want to ensure our continuing assess to them. A great way to explore the great outdoors in the winter is the sport of skijoring. This activity combines skiing with man’s best friend who loves being able to run and run. The dogs get a charge out of it, and because of the close proximity, the feeling of unity – oneness with the team – cannot be matched. As a person soon finds out – you will work as hard as the dogs – especially when going uphill. This a relatively low cost and easy sport to become involved in. The well being of the dog is paramount and the first piece of equipment is the dog harness. A properly fit harness will distribute the force across the dogs chest and body. The tugline is relatively short, 12 -15 foot with a bungee cord at one end, is connected to a belt worn by the skier. Montana’s own Adanac Sleds carries the harnesses and the complete skijoring package. You will find them to be very knowledgeable and helpful. Just as you don’t go out and run a marathon without preparation and training – skijoring takes physical training by both you and the dog(s). Starting a fall exercise and training program is ideal. 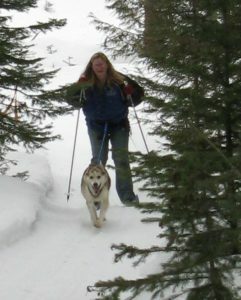 Start with short skijoring runs and increase the distance the more conditioned you and your dogs become. Be sure to hydrate both yourself and the dogs. Be prepared for weather changes. Learn More and get involved with Montana Mountain Mushers. Visit our Exchange link and find deals on mushing equipment. Our links page will direct you to many of the popular web sites focused on sled dogs and sled dog racing.